Scottish architects Thomas Robinson Architects have just had the very first EnerPHit certified build in Scotland signed off. What was a draughty traditional Scottish barn, is now one of the country’s most energy-efficient homes. EnerPHit is a standard of energy-efficient building that comes within the Passivhaus system. EnerPHit and Passivhaus standards create truly efficient, comfortable, affordable and ecological homes. They are more than just low-energy standards. Passivhaus is used for newbuilds. EnerPHit is used for retrofit or renovated houses, where the presence of older materials (a crumbly barn wall, for example) mean different methods are used to create extreme energy efficiency. One reason more architects don’t use the Passivhaus and EnerPHit methods is that they require a very detailed and monitored process, to make sure all the standards are accurately reached. The aim is to reduce carbon emissions, improve energy efficiency and ultimately achieve greater energy security, while creating an exceptionally pleasant environment to live in. This is done via a variety of methods. People want comfort, a healthy and fresh indoor environment and great energy performance. These things are talked about by most building professionals, but the Passivhaus methodology is underpinned by scientific reasoning. This means there are clear targets set for things like what temperature humans find comfortable in a fully draft-free environment; what the optimum air change rate is for good human health while also achieving energy efficiency; and what heat load should be achieved beyond which insulation levels and airtightness measures become too extreme to achieve benefit. The standard is extremely rigorous, but unlike other building energy measurement schemes the performance modelling has been proven to be very accurate. 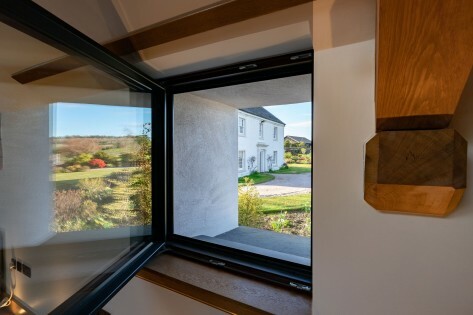 Architect Tom Robinson has long been interested in the Passivhaus method, believing it to be a sophisticated and reliable way of building in an ecological, sustainable and eco-friendly method. To get a Passivhaus building certified requires that an independent Passivhaus Certifier checks the Passivhaus Planning Package software calculations carried out by the designer. Also, delivery note evidence must be submitted for all relevant products used such as windows, doors, insulation, airtightness seals membranes and tapes. Documentation of airtightness tests and mechanical ventilation and heat recovery systems used must be submitted for checking, together with photographic evidence of the construction, showing every stage from insulation of the soil pipe drainage pipework under the floor to sealant of the insulation around the mechanical ventilation duct where it goes from the MVHR unit to the outside and everything in between. This degree of rigour is not something that the construction industry in Scotland is used to. It requires the contractor to fully embrace it and everyone on site to understand what is at stake.